Sienna joined the firm as an articling student in 2017 and returned as an associate upon her call to the bar in 2018. Sienna practises in all areas of civil defence litigation with a focus on professional liability, including the defence of mortgage brokers and insurance brokers, amongst other professionals. 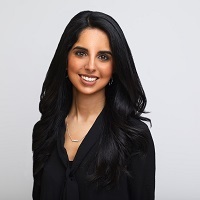 She is building her practice to expand in the Sports and Entertainment law sector, providing client-focused advocacy for elite athletes and entertainers. Sienna is a contributing author to the Annual Review of Civil Litigation 2018, a publication regularly cited by appellate courts across Canada including the Supreme Court of Canada, with an article titled Sexual Aggression and the Civil Response. Sienna attended law school at BPP Law School in London, United Kingdom and obtained her LL.B with honours in 2016. In her final year of law school, she received an award of distinction for highest standing on her final legal research project regarding Public Law and Counter-Terrorism. Sienna leverages her diverse experience to provide unique insight and bring strategic depth to her civil litigation practice.